With winter upon us, it’s time to start cranking up the heat. The switch from cool to hot means your AC unit is sure to need a check-up. When the mercury starts dropping, it’s time to schedule professional season maintenance for your HVAC unit. Winter’s arrival doesn’t mean you hibernate your HVAC system—the same system that keeps your home cool also warms you up during the cold months. For this reason, it’s important to ensure that everything is in good working condition. As a part of your home or business, your heating and cooling system is an investment you should protect. Another reason for maintaining your HVAC is your utility bill. With regular maintenance, your system will function more appropriately and efficiently. The machine will also use less energy to operate, increasing your energy savings. Another reason to carry out regular maintenance is to keep your warranty. Depending on your manufacturer, it’s recommended that you conduct routine servicing of your HVAC equipment at least once a year. This suggestion by manufacturers is a great tip to avoid breakdowns of your system during the times when you need it most. With proper maintenance, your system will be able to work for an extended period with little stress. You can increase the lifespan of your equipment with minimal wear and tear. The air ducts are a vital part of your HVAC system, and they should be cleaned periodically or debris is bound to accumulate inside. Never let vents become an issue. Although you should seek professional help, it’s advisable that you carry out regular cleaning throughout the year to keep dust, mold, pet hair or any other pollutants from building-up. A clogged duct means pollutants are being blown back into the house, and your system must work twice as hard. With the help of a paper towel, you can easily carry out monthly cleanups by wiping away residue from inside the ducts. While the inside of the unit is important, the surrounding areas are equally crucial. Clean up any leaves, branches or other debris that has accumulated around the HVAC system. Additionally, you should mow any grass around the unit. Vegetation, dust or dirt may end up affecting the system’s functionality or efficiency. As the single most essential item that ensures efficient operation of your unit, air filters should be replaced regularly. We recommend changing your filters every one to three months. 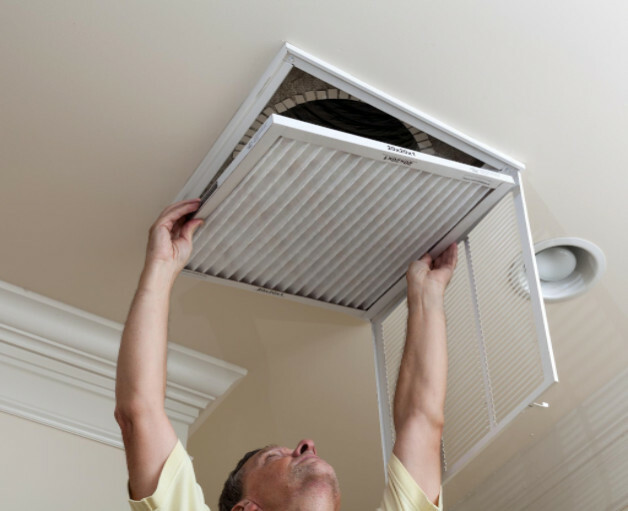 Dirty air filters will prevent your HVAC system from adequately heating or cooling your home. With regular use expected during the winter, it’s recommended that you change your screen before turning on your heat. When not in use, the system’s fans can accumulate dust or debris. Furthermore, ash or soot may build up in your furnace, which can be a fire hazard. Regular inspection can avert a potential disaster from happening. A smart thermostat will undoubtedly be of significant help to you. With a programmable device, you can quickly change your temperature settings to match your needs or the outside environment. Furthermore, advanced technology has made it possible for automatic smart thermostats that learn and operate on their own. The best times to schedule your service appointment are in spring and fall. With the help of a qualified HVAC technician, you can service your residential heating & air unit at least twice a year. During the inspection process, your technician should check the furnace and blowers and make the necessary amends needed to ensure a safe and efficient HVAC system.